Sachin Jain is persuading journalists in India to produce investigative journalism that impacts major social problems. By producing and disseminating robust human rights and evidence-based research, Sachin Jain is persuading journalists in India to go beyond chasing salacious headlines and web page views and produce investigative journalism that impacts major social problems. By strengthening relationships between civil society and the media, he encourages journalists to go to citizen sector organizations (CSOs) when looking for story ideas instead of stalking Bollywood or the business beat. Sachin's New Idea: Recognizing the untapped potential of the mainstream media to shift the mindsets of the government, judiciary, and the public, Sachin is training a network of informed and empathetic journalists who can influence large-scale social change through in-depth reporting. At the same time, he builds the capacity of CSOs to use research and work with the media so reporters can tell “the whole story” about issues affecting marginalized communities, such as malnutrition and migration. Through his organization, Vikas Samvad Samiti (VSS), or “Society for Dialogue on Development,” Sachin helps CSOs build a deeper understanding of entrenched social challenges so they can create compelling storytelling campaigns, which are then spread through the media. In addition, he arranges field visits between journalists and CSOs to help establish trust-based partnerships and power a collaborative advocacy platform that influences institutions like the judiciary and the legislature to create policies that sustainably tackle social problems. Based in Madhya Pradesh, a large state in central India with a population of more than 75 million, VSS holds discussions through media forums and positions social reporting as an opportunity to create unique content that stands out from the crowded media landscape. VSS also operates a nationwide media fellowship program that further embeds pro-civil rights journalists across media organizations throughout the country. Having proven this advocacy model, VSS aims to develop an operational framework to help other organizations replicate the model in other states and countries. VSS is currently active in ten states in India, and Sachin wants to go deeper across South Asia, including Bangladesh and Sri Lanka, to train more journalists and strengthen their connection to civil society organizations. 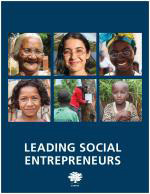 Sachin' s story appears in the 2018 edition of "Leading Social Entrepreneurs" which features a selection of just a few of the Ashoka Fellows recently brought into the largest global network of social entrepreneurs. The LSE presents some of the newest innovations by leading social entrepreneurs whose ideas are changing the way things are done all over the world. We invite you to support Ashoka by sharing these stories and helping us continue to find and invest in the next generation of systems-changing social entrepreneurs.